Picture caption: Olympic boxing Champion Nicola Adams and Danny McGuire from Leeds Rhinos showing their support for the child friendly Leeds campaign. Two sporting superstars from Leeds have joined forces with Leeds City Council to remind families to make sure they take up the free school meals they are entitled to. 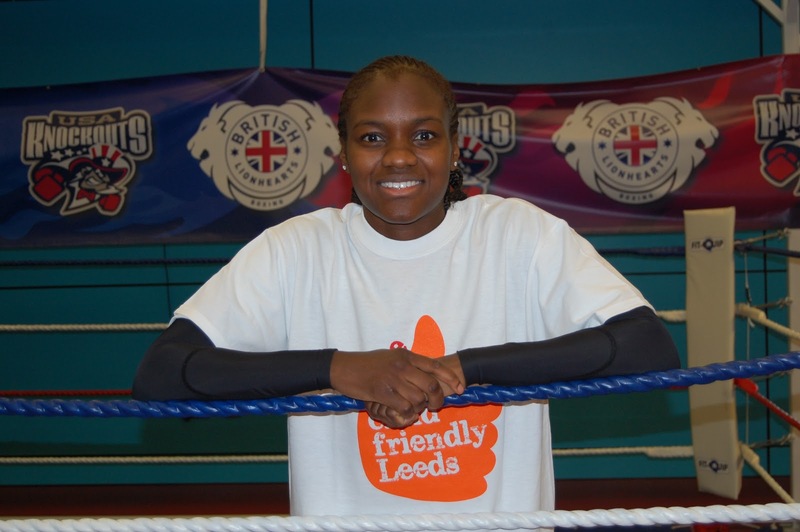 Olympic boxing champion Nicola Adams, and Leeds Rhino Danny McGuire have both agreed to be Child Friendly Leeds ambassadors with a specific focus on free school meals. Both Nicola and Danny went to school in Leeds and have grown up to be sporting role models for children of the city. As part of the ambassador role, Danny and Nicola have agreed to support Leeds City Council’s campaign to encourage every child who is eligible for a free school meal to take up the offer. In Leeds there are around 20,000 pupils who are eligible for a free school meal, but around 4,500 of those do not take up their entitlement. As well as making sure each child gets at least one, health and nutritious meal a day, it would also save parents around £10 a week – which adds up to nearly £400 each school year. Olympic boxing champion and child friendly Leeds ambassador, Nicola Adams said:“I think this campaign is fantastic. Eating healthy is really important – it gives you energy to do your lessons during the day and it gives me the energy to be able to do my training, without the right meals and the right vitamins and minerals I wouldn’t be able to be where I am today. If you eat right you can study hard and train hard as well. “I think it’s really important that people take up the free meals, getting kids to eat a really healthy meal, and the extra money they save can be used elsewhere too. Danny who was also born and bred in Leeds, went to the same primary school as Nicola – Richmond Hill. It’s also Danny’s testimonial year at the Leeds Rhinos. Danny Maguire said: “It’s a real honour to be a child friendly Leeds ambassador. I’m proud to be from Leeds and representing Leeds throughout my careers at different sports, at Rugby and football and cricket, so it’s great to give something back. I think as a whole it’s a fantastic city, we’ve got everything you can imagine, we’ve got great sports teams, we’ve got great city, and great people, I feel proud and fortunate that I’m from Leeds. Child friendly Leeds ambassadors inspire others to make Leeds a better place for children and young people. Children’s Commissioner Maggie Atkinson, a champion for children across the whole of the UK, is also a child friendly Leeds ambassador. There is also a steady stream of ambassadors coming forward from Leeds schools, colleges and organisations such as the NHS and West Yorkshire Probation Service. Councillor Judith Blake, executive board member responsible for children’s services said: “It is great to have Nicola and Danny on-board – they are true role models for our children and young people. But you don’t have to be famous to be Child Friendly Leeds ambassador; you just have to be proud of our city and willing to help us make it a better place for our children. “In Leeds we are committed to making sure our school lunches are tasty and healthy, as well as making lunchtime comfortable and fun for everyone. Yet everyday children are still missing out on their free school meal. Businesses and organisations across the city are also being asked to make a child friendly Leeds pledge, and say what they’re going to do to make Leeds the best city for children. This could include building stronger links with local schools, arranging for staff to become mentors to young people in care, helping to promote and support foster care across their workforce and looking at how they can change their services to make them more child friendly.